What is DOI and how can I locate a full-text article using it? Who can access databases off-campus? I logged in but nothing seems to happen. How do I access databases off-campus? Depending on the entrance you click on for our databases you will get one or two requests to login. Please follow the directions when entering the requested information. If you can't connect, please contact the Help Desk via email or by phone at (660) 562-1634. Chat with a librarian if you need more assistance. What is a DOI and how can I get to the article with it? A DOI is a unique alphanumeric string (such as 10.1078/1433-8319-0056) assigned to identify content. This often means that your password has expired or you typed an incorrect password. The first step of troubleshooting this is to try myNorthwest to see if you can login successfully. If you cannot login on myNorthwest either, please call Help Desk at (660) 562-1634 to reset your password. 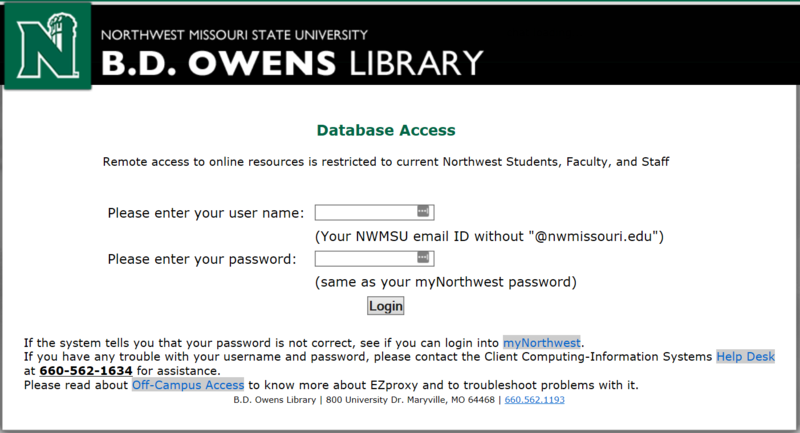 If you can successfully login to myNorthwest, but still can't login to search library databases or read linked articles, please check if you have any credential- or password- management software on your machine. (Northwest provided laptops have this software.) The credential software will not automatically update your password even if you have updated one for the campus login. You need to type in your new password on the login page in order to apply the changes on your machine. Popup blocker: Disable pop-up blockers while you are accessing the restricted databases through EZproxy. Firewall: If you see"this page cannot be displayed," it usually means a firewall issue on your side. If you have installed personal firewall software such as Norton Antivirus. You either need to allow access to ezproxy.nwmissouri.edu (or 198.209.246.37) per port or add ezproxy.nwmissouri.edu as a safe site. Cookies: EZproxy and some databases send "cookies" when you connect to them to verify that you are an authorized user. If your browser reports an error receiving a "cookie," you have to enable them in your browser settings. Use the NWMSU_Secure wireless network instead of the NWMSU_Guest wireless network. All University provided laptops are capable of this setting. Register your laptop with the Information Technology Helpdesk at (660) 562-1634 to access the NWMSU_Secure wireless network. Use a network cable and plug it in a network jack nearby. If you are in the library building and need a cable, check one out from the Library Services Desk, 1st floor. Many corporate, government, and educational institutions use firewalls for security purposes and block every port other than standard web browser ports. Please send the Help Desk an email that includes the error message. This usually means there is an issue in the Northwest Missouri State University Campus Network. Please send the Help Desk an email that includes the message. Who can access library databases? All Northwest faculty, staff, and currently enrolled students. Owens Library's electronic resource license agreements prohibit off-campus access to these resources unless a student is currently enrolled. Students who have a delayed grade in a course and who are not currently enrolled are not current students as defined by these license agreements.